This finely crafted leather lead is a great way to share your respect and admiration for those that have offered protection in our lives. Fine craftsmanship shows in this custom made to order black leather leash. Features a royal blue leather stripe down the center with painted and stitched edges. The added nickel D-ring by the handle is a great detail. It allows you to attach a matching poop bag holder or anything you prefer to hook on to it. All collars and leads in our leather category are lead-free and hand-crafted in the USA. A coordinating leather collar is available. 4 ft x 3/4", 4 ft x 1", 5 ft x 3/4" and 5 ft x 1"
Please allow 4-6 weeks for completion. These items are handmade and special order. Well worth the wait! 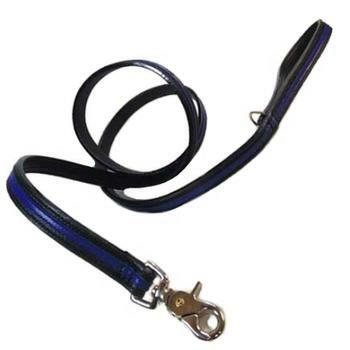 This is a custom, made to order dog lead and is not eligible for exchange or return.